Former Porsche development chief wants to apply the GT3 treatment to the Audi TT. 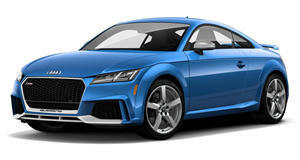 If you like the Audi TT, there&apos;s a number of engines to choose from. The base model can be had with engines ranging from around 200 horsepower to nearly 250 in base form. Not enough? There&apos;s the 268hp TTS. Still not enough? Try the 335hp TT RS on for size. Even more? The latest TT RS Plus packs 355 hp. But Audi isn&apos;t about to stop there. Word has it that the German automaker is working to increase the car&apos;s power-to-weight ratio even more, only not with more muscle - with less weight. The lightweight TT is tipped to get a similar treatment to the Porsche 911 GT3, trimming excess fat, fitting a roll cage and possible tightening up the suspension to near track levels of firmness. Considering that the existing TT RS Plus (pictured) already hits 62 mph from a standstill in 4.1 seconds, the GT3 version could drop that time wel into the threes (assuming the same engine is used). The reports are attributed to Wolfgang Durheimer, who prior to taking up his current role as head of development for Audi, did the same for Porsche, but in between headed up both Bentley and Bugatti. In other words, the man knows a thing or two about performance. Audi, lest we forget, is a pioneer in lightweight construction. The first-generation A8 introduced in 1994 was the first all-aluminum car to be mass produced, and Audi continues to develop new means of reducing its cars&apos; curb weight. See what we mean in the video clip below.